Starting a business hard. It's unforgiving, it's stressful and it's a money sink. Every day and event is bringing on tons of new challenges. I had my first two real events this past weekend. 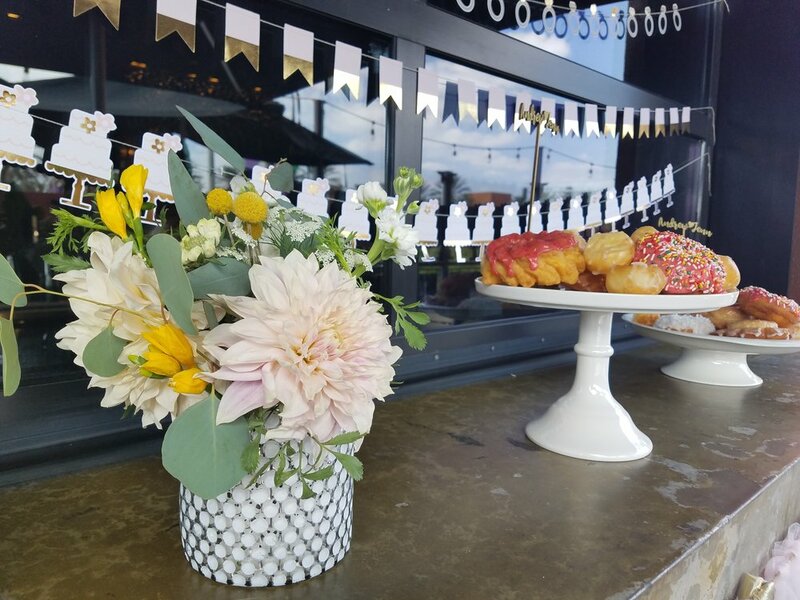 I was able to do a bridal shower at a local restaurant in Tustin, Bonefish Grill, and I did a bridal bouquet and boutonniere for a friend's wedding in Westminster. I had my flower pick up set for Saturday morning at 7am. I put out all of my floral supplies the night before and my buckets were cleaned and prepped. The flowers I picked up were beautiful. The Charity Garden Roses were opening just a bit and looked amazing. I also picked up fragrant freesia and the most amazing dinner plate dahlias. Now, I love the look of those dinner plate dahlias. They are so romantic and elegant. Little did I know how temperamental and difficult they would be to work with. I'm going to chalk that up to naivety and ignorant optimism. As I taped my grid on to my vases, I was feeling confident and excited! That slowly disintegrated into doubt and defeat. There was nothing particularly hard about the arrangements and I had wonderful starting materials, I just began to feel overwhelmed. Can I really do this? Why am I doing this? Is the bride going to be happy? A million questions raced through my head cascading into more and more questions. I finished the final product and was happy enough to get into my car and enjoy the afternoon chatting and celebrating the bride. On Sunday, up on deck was a simple bridal bouquet and boutonniere. I used the same theme of flowers that I had used the day before for the shower. I focused much more on the garden roses, used white freesia instead of yellow and added hints of astilbe for more elegant look. This was hard. Handling a bouquet and crafting it into your vision is tough. All I kept thinking about is making sure that my bride was happy. I wanted her bouquet to be an expression of her without taking in ounce of her spotlight. My dahlias were limping along at this point, so I had to run out and try and find new stems. Thankfully, there is a flower shop open on Sunday that had ample amounts of the cafe au lait dahlias. After finishing the bouquet, I moved on to the boutonniere, which had eucalyptus, craspedia and freesia. It was simple and a perfect compliment to the bouquet. It was the one win I needed to get me in the car and off to the venue. So, what did I learn this weekend? A few things. A floral fridge would be great, but in its stead, I'll have to use intuition and knowledge from all of the amazing florist before me (read: internet) and take care of them in the house as best I can. Not everything is going to be perfect...and that's ok. Imperfection makes it perfectly unique. As a type A personality, I don't deal with failure well, but it is the best way to grow as an artist and a person. Learn. Grow. Every opportunity is a door to greater knowledge. To everyone out that striving to share your art with the world. We got this! It's hard and that is why it's worth pursuing. Let's keep making the world a more beautiful place.